ALAMEDA, Calif. (AP) — The Oakland Raiders spent the first quarter of the season getting close before finally breaking through for their first win against the Cleveland Browns. A lopsided loss to the Los Angeles Chargers looked like a step back, even if coach Jon Gruden tried to put a positive spin on the game Monday. Gruden then went on to praise the play of eight rookies, including tackle Brandon Parker and defensive tackle P.J. Hall, fill-in left guard Jon Feliciano, and some good plays made by Derek Carr outside of a costly interception on first-and-goal from the 1. 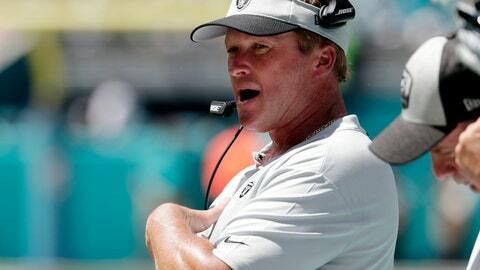 “I’m going to continue to emphasize the good and do everything I can to fix the things that are bad, because most of the things that are bad, my fingerprints are all over,” Gruden said. It was not easy to sugarcoat this game, which marked the first time all season the Raiders (1-4) never held a lead. The pass rush generated little pressure, the defense created no turnovers, special teams provided no short fields, and Carr threw an interception at the worst time possible. With the Raiders trailing 20-3 and looking to mount a comeback late in the third quarter, Oakland had the ball first-and-goal from the Los Angeles 1. Despite the presence of powerful back Marshawn Lynch, Gruden opted to call for a play-action pass on first down. When no one broke open immediately, Carr held onto the ball before trying to force it to Derek Carrier in the end zone instead of throwing the ball away. Melvin Ingram was right there for an interception, marking the second time this season the decision to use Lynch as a decoy at the goal line backfired. Fullback Keith Smith was stopped on a fourth-down run from the 1 in a 20-19 loss at Denver last month. And of course, Lynch is still smarting from another goal-line interception that cost him a Super Bowl title in Seattle back in the 2014 season. Lynch tossed his helmet up in frustration as he left the field and didn’t play the rest of the day as the Raiders were in their hurry-up offense for their only remaining drive. Gruden said he threw his visor and helmet in anger as well, and that frustration was something he had in common with Lynch. He still stood by the play call even if the execution didn’t work. The Raiders have little time to dwell on this loss with a trip to London coming up this week to face the Seahawks. Rather than request an East Coast game before the long trip and either practice there or in London for the week, the Raiders opted to stay at home for most of this week. They will practice Tuesday through Thursday at their facility in the Bay Area before taking the long trip to London on Thursday night. They will arrive Friday afternoon and then get ready for the game Sunday night.